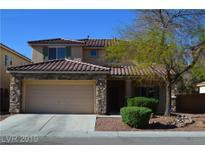 Below you can view all the homes for sale in the Terrasol subdivision located in North Las Vegas Nevada. Listings in Terrasol are updated daily from data we receive from the Las Vegas multiple listing service. To learn more about any of these homes or to receive custom notifications when a new property is listed for sale in Terrasol, give us a call at 702-323-5963. The patio cover extends along the entire back of the home (3 fans) giving you lots of shade on hot summer days! Grassy area and palm trees. MLS#2089131. Resolution Realty. AWESOME move-in ready home that inc a large downstairs den & upstairs loft w/balcony, BIG breakfast bar island kitchen has cooktop along w/double convection ovens, BIG living room & LARGE dining room, most downstairs flooring is AWESOME man made wood & remainder is tile, BIG secondary BR's, BR#3 w/walk-in, sliders off kitchen to side patio & HUGE driveway, BIG rear yard has cov patio, large slate patio, "as-is" fountain, syn grass and much more MLS#2088497. Prime Acre International LLC. This home is part of the Terracina Terrasol Homeowners Association. MLS#2077672. Opendoor Brokerage LLC.